IMAGE: This visible image of Tropical Cyclone Ula was captured by the MODIS instrument aboard NASA's Aqua satellite on Jan. 5, 2015 as it continued to move west, past Fiji. 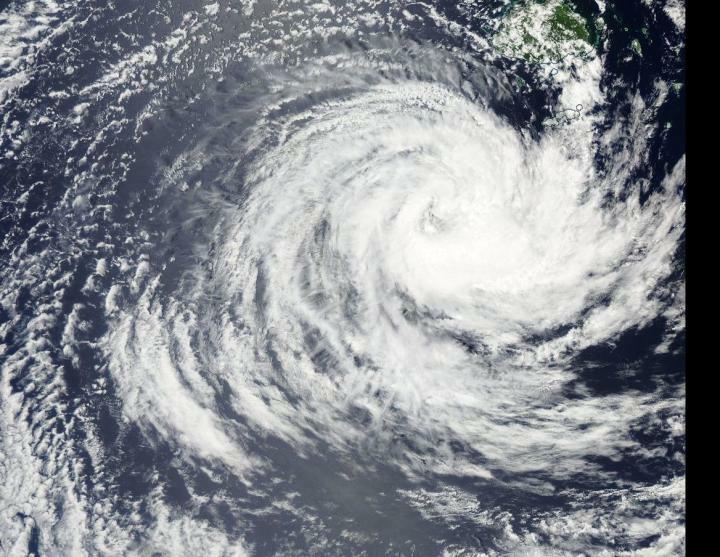 Tropical Cyclone Ula continued to move west, passing south of Fiji when NASA's Aqua satellite passed overhead and captured an image of the weakening storm. The Moderate Resolution Imaging Spectroradiometer or MODIS instrument that flies aboard NASA's Aqua satellite captured a visible image of Tropical Cyclone Ula on Jan. 5, 2015 as it continued to move west, past Fiji in the South Pacific Ocean. The image showed bands of thunderstorms wrapping into the low-level center from the northeast and around the southern quadrant of the storm. Infrared satellite imagery on Jan. 6 revealed that the thunderstorm development has "shrunk and become more shallow," according to the Joint Typhoon Warning Center. In the low levels of the atmosphere, dry air from the southwest of the storm is wrapping into the core and sapping evaporation and thunderstorm development. At 0900 UTC (4 a.m. EST) on Jan. 6, Tropical Cyclone Ula's maximum sustained winds had dropped to 35 knots (40 mph/62 kph) making it a minimal tropical storm. Ula was centered near 20.3 degrees south latitude and 176.3 east longitude, about 178 nautical miles (204 miles/329.7 km) south-southwest of Suva, Fiji. It was moving to the northwest at 5 knots (5.7 mph/9.2 kph). The Joint Typhoon Warning Center forecast calls for Ula to move northwest and continue to weaken. The system is expected to dissipate soon, but could regenerate.